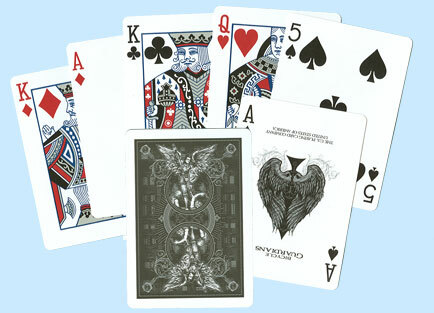 These Bicycle Guardians Playing Cards are made on premium quality Bicycle stock for superior performance. The decks feature a unique Bicycle Guardian Angels design inspired by the classic Rider back. A double-back card for magic tricks and a tips and tricks card are included with each Guardians Deck. For more information or volume pricing on Bicycle Guardians Playing Cards, please contact us at 1-800-233-0828.